Doodle Jump (69p, iPhone) was one of the earliest iOS smash hits. The game was released in April 2009, and by the end of the year it had been downloaded over a million times. It's since spawned a slew of similar titles, and although few have come close to matching the original's financial success, many offer enough innovation for any iOS gamer obsessed with helping a virtual character bounce towards the stars. To be fair to games using Doodle Jump as a template, it's possible that Doodle Jump creator Lima Sky was also inspired by an existing game. Way back in August 2008, Sunflat released PapiJump (Free, iPhone), a simple effort that featured grinning pink sphere Mr Papi bouncing up an endless number of green platforms. This was followed by PapiJump Plus (69p, iPhone), which introduced a number of game modes, including one where the hero munches hamburgers to power fireballs used for blasting spiked monsters. Clearly, Mr Papi needs to lay off the meat. These days, the PapiJump games are a bit basic to recommend – although we remain fans of semi-sequel and tilt-based adventure PapiJump Land (69p, iPhone) – largely due to Doodle Jump. Lima Sky's game started off by using a now much-copied 'doodle' aesthetic and combining many of the features from the PapiJump games into a single mode, resulting in a more varied, exciting game. Since then, several visual themes have been added, some of which subtly alter the gameplay. Aware it was on to a good thing, Lima Sky extended the Doodle Jump roster. There's the festive Doodle Jump Christmas Special (69p, iPhone), Doodle Jump for iPad (£1.99, iPad) and Doodle Jump: HOP The Movie (Free, Universal). The movie tie-in is interesting, replacing the original's endless mode with 25 unlockable levels, each with a specific goal. Once you've climbed the high score tables, defeated your friends and exhausted Doodle Jump's themes, what next? That depends on the experience you want. If you're after something similar to Doodle Jump that mostly provides fresh visuals, Jump and Fly (69p, Universal) is worth a look. The game is a polished, cartoonish take on the genre, with lovely graphics. The controls are twitchy, but we quite liked one of its few innovations – a wings power-up that can be deployed by madly tapping the screen as your tiny ninja is about to plummet to his doom. Elsewhere, Jump Pack (Free, Universal) provides another alternative visual take on Doodle Jump, but veers towards pulp sci-fi. The game features a steampunk superhero with a duff jet pack. Instead of soaring into the sky, he's left bounding from platform to platform, grabbing green gems and trying to avoid being thwopped by the occasional lurking metal monster. The game's one black mark is IAPs, used to buy more gems to pay for new hero outfits and game levels. They max out at a whopping £69.99, so don't leave your device signed in near any youngsters who might fancy buying the hero an expensive hat. Anooki Jump (69p, Universal) won't empty your bank account, but it might win you over. It features adorable Eskimo children Anook and Nooki, bounding about on giant ice cubes. With each jump consuming energy, they must periodically switch places, and the angled chunks of ice make movement less predictable than in most jumping games. Anooki Jump is very beautiful, with sharp white characters and obstacles on vibrant backgrounds. Sir Lovalot (69p, iPhone) is also a charmer, albeit in a different way. The eponymous knight aims to discover beautiful maidens, in an endless quest up an endless tower. The lack of Retina graphics is a pity, because the great character design is slightly muddied on newer hardware. But a 3D twist – jumping platforms surround a spinning tower – gives fans of the genre something new to tackle. A few games move further from Doodle Jump's premise of hopping about on platforms, yet remain familiar enough to appeal to fans. Mega Jump (Free, iPhone) replaces platforms with coins, which give you a little boost when collected. The game is tougher than Doodle Jump, demanding that you rapidly position your monster above the next coin, but it's rewarding when you manage to complete a level. The game also features tons of power-ups, including flames that propel the jumper up, while he squeals with glee. Namco's PAC'N-JUMP (£1.49, Universal) has similar gameplay, alternating boost-style collecting with more traditional Doodle Jump platforming. We criticised this game in issue five's Pac-Man round-up, but – humble pie time – have since grown to like it. The five stages play with classic Namco arcade games in an amusing way, the graphics are rich and well-defined, and the controls are tight. This is just as well, given the relative toughness of the boost sections. Our final games also stray from the genre's roots, but are among our favourites. Bird Strike – GOLD EDITION (69p, iPhone) and Bird Strike Featherlite Edition (Free, iPhone) feature Gerald. Most birds are happy to flap their wings and soar, but Gerald's a bit odd so prefers to cling to rockets and wear jet packs. These wear out quickly — instantly, even, if Gerald collides with anything during his ascent. 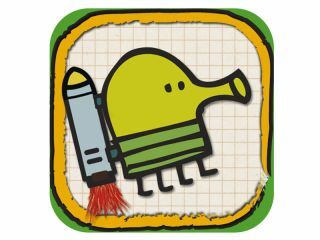 The game's therefore a little like Doodle Jump, but if jet packs and rockets were platforms and everything else was to be avoided. It's also a memory test, since success depends on you remembering what's above (to avoid hitting it next time) and what's below (to grab power-ups that you missed and avoid Gerald falling to the ground). The Gold Edition adds a World Tour to the Endless Mode, where you reach a UFO that sends Gerald downwards in an avian blaze of feathery destruction. And then there's GoatUp (£1.49, Universal) – a game that's lovely, challenging and bonkers, roughly in equal measure. Your goat bounds up platforms, kisses billy goats, munches grass and has multicoloured kids that are used as a 'whip' to take down the enemies that pepper the increasingly oddball levels. Developer Jeff Minter was reportedly inspired by ancient Atari platform games Canyon Climber and Miner 2049er, along with Atari VCS indie effort Man Goes Down. The last of those features a man tasked with leaping down an endless number of platforms, which is a sort of reverse Doodle Jump — but from four years before Lima Sky's game appeared.